We’re officially in the holiday season (I’m pretty sure it started before the Halloween trick-or-treaters got home with their candy), which means it’s time for cheesy Christmas movies. And I do love cheesy Christmas movies. Netflix Original The Princess Switch feels like a mashup of The Parent Trap and The Princess Diaries, but it works because it embraces the ridiculousness of the concept. Vanessa Hudgens stars in the double role of Stacy, the Chicago baker who goes to the fictional monarchy of Belgravia to compete in a Christmas baking contest and Lady Margaret, a royal who’s soon to marry a Belgravian prince and wants to know what it’s like to live as a normal person. The two women switch places and romantic hijinks ensue. It’s sweet, fun, and recommended if you’re into this sort of thing. Kurt Russell stars as Santa Claus in The Christmas Chronicles, a tale of two siblings who almost ruin and then save Christmas. Kate (Darby Camp) and Teddy (Judah Lewis) lost their father and Christmastime hasn’t been the same same ever since. But Kate is still a true believer in Santa, and talks her brother into staying up to try to catch old Saint Nick on video when he visits their house. It works, and they manage to sneak aboard his sleigh while he’s delivering other gifts in their neighborhood. When he discovers the stowaways, the distraction causes Santa to crash his sleigh and lose his sack of presents, his magic hat and his reindeer. The two kids become Santa’s helpers to recover the lost items and save Christmas. I enjoyed this one for the relationship between Kate and Teddy, as well as Russell’s mugging for the cameras. I’m not quite sure what to make of the CG elves that show up near the beginning of the movie’s final act. They’re cute, and seem designed to interest kids and sell toys… but by the time they show up, I wonder if those kids are still paying attention… the first twenty minutes sets up the Pierce family dynamics and doesn’t seem all that magical to those with short attention spans. The Christmas Chronicles is also recommended for those who enjoy sappy Christmas movies. The holiday season is for the young and the young at heart… and there are an awful lot of folks who can’t imagine decorating for Christmas without setting up a model train under their tree. For those of us who don’t have the space (or patience) to set up tracks, there are a number of places to go to see a full-scale layout. The New York Botanical Garden’s Holiday Train Show is celebrating its 25th season, and will be open through January 16th if you haven’t had a chance to see it yet. This Saturday, the Somerset Patriots will hold their annual holiday toy drive at TD Bank Ballpark in Bridgewater. Fans can bring new, unwrapped toys to the Team Store. They will be donated to The Salvation Army of New Brunswick. The Somerset Patriots will hold their annual holiday toy drive at TD Bank Ballpark this Saturday, Dec. 7. Fans are being asked to bring new, unwrapped toys to the Somerset Patriots Team Store . All toys will be donated to Foster Adoptive Family Services of New Jersey for those less fortunate. Manager Emeritus Sparky Lyle and Manager Brett Jodie will be at the event to meet fans, sign autographs, and take pictures from 10 a.m. to noon. Santa Claus and the team’s mascots will also be available for photos. ‘Tis the season, so here’s more from the Newark Bears Toy Drive – this time, via the team’s YouTube account. In other Can-Am League news, the Toronto Blue Jays purchased the contract of left-handed pitcher Tony Davis from the Quebec Capitales today. He went 2-0 with a 1.06 ERA in 20 regular-season relief appearances, striking out 16 in 17 innings pitched. Originally selected in the 12th round of the 2009 draft by the Minnesota Twins, Davis made it as far as Double-A in affiliated baseball. Earlier this off-season, Quebec sold the contract of right-handed pitcher Chris Cox to the Arizona Diamondbacks organization and the Newark Bears sold the contract of right-handed pitcher Omar Javier to the San Francisco Giants organization. 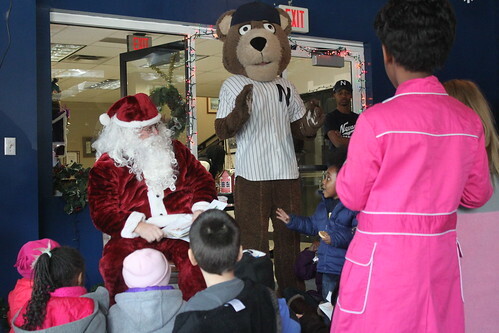 Santa Claus visited Bears & Eagles Riverfront Stadium in Newark this weekend to make the holiday season a bit brighter for some Essex County children. The Newark Bears shared some photos from the event through their Flickr account today.